Reality TV shows such as I'd Do Anything and How Do You Solve A Problem Like Maria have stimulated an interest in musical theatre. Now, a new venue at the Edinburgh Fringe is dedicated to this much-maligned art form. Of course, as this is Edinburgh, the 29 musicals being performed are not quite the old favourites such as Cats or West Side Story. Titles include Miss Sign-On, Zanna, Don't! and Big Bruvva - The Musical. There is also Cannibal! - The Musical, based on the cult film by Trey Parker, the creator of the South Park cartoon series. One of the shows features two performers who came to prominence in musical-based reality TV shows. 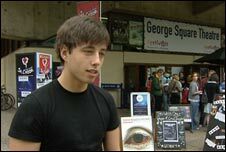 Keith Jack came second last year in Any Dream Will Do, the BBC's bid to find a Joseph for a West End show. Niamh Perry was one of the contestants attempting to be Nancy in Oliver! in this year's I'd Do Anything. They have teamed up to appear in Only the Brave, a musical about love and loss set during World War II. Perry, from Bangor, Co Down, said: "It has been really lovely to have my first professional job, to see what this industry is all about. "It has really given me a taster and spurred me on to do this for the rest of my life, hopefully." Jack, from Dalkeith in Midlothian, said: "I've always loved musical theatre. "To sing and perform in front of crowds of people who enjoy the music and enjoy the shows and to take on a different character and to create something that is not yourself is just a great thing to be doing." Only Brave is a new show like many of those on offer at the Musical Theatre. Chris Grady, programmer of musical theatre at the George Square, said having the venue allowed companies to take artistic risks and attempt to produce the hit musicals of the future. He said: "There was no theatre anywhere in Britain dedicated to musical theatre. "When the opportunity came and the university was looking to refurbish the theatre and reopen it with something, the idea came together to make this a hub. "It is not a hub that would do old classic musicals, though we have got a few classics, but mainly that would look for new work and make new work happen." It is hoped the dedicated space will prove a useful training ground for up-and-coming performers. Andrew Panton, acting head of musical theatre at the Royal Scottish Academy of Music and Drama, said: "It gives the students an experience of working as a rep company and what it is like. "They are all in two or three shows so they are working across completely different styles."